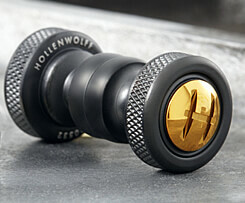 HollenWolff cufflinks are precision machined from solid bars of steel on Swiss watch-making equipment. Known for its hardness, corrosion resistance and corresponding difficulty to machine, surgical grade 316L stainless steel is the standard material for all our cufflink and shirt stud components, with select bodies also machined in C510 marine grade patinating bronze. The production time for personalized cufflinks is within seven days, with a selection of our most common combinations available for immediate, expedited shipping. 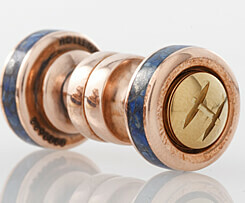 HollenWolff bearing-lock cufflinks are what we call mechanical cufflinks. 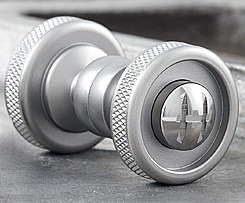 Both sides of the cufflink look identical, but a push button on one side activates a locking mechanism. This is accomplished through the precision engineering of 22 moving parts. These unique cufflinks are installed into the shirt cuffs before you put the shirt on – then simply snap the two sides together. The cufflinks can be opened or closed while being worn, without falling out – for example, to roll up one’s sleeves. 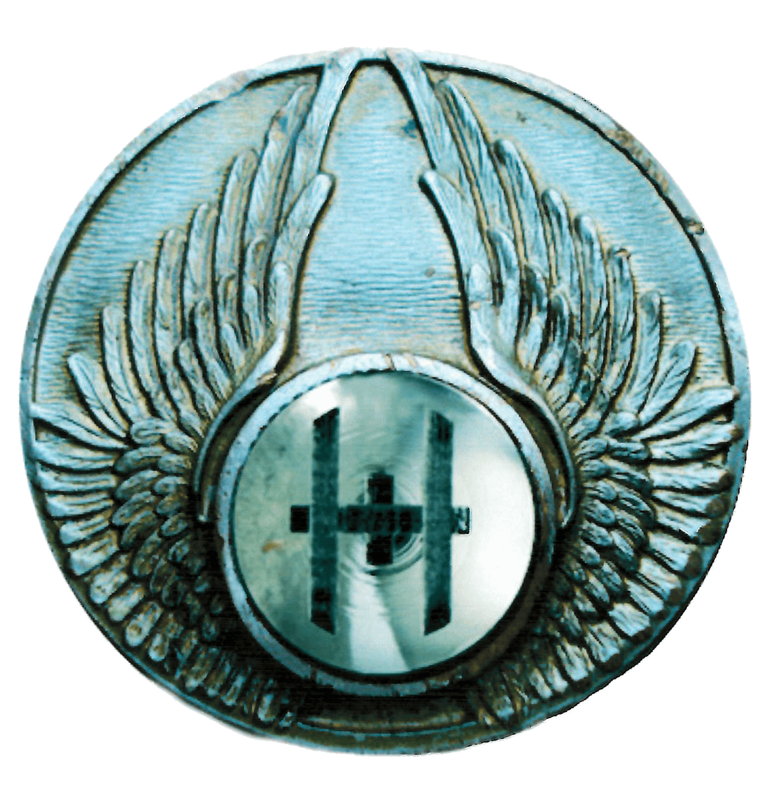 HollenWolff cufflinks are available in two sizes – the .68 caliber is approximately the size of a dime, and the .55 caliber is close to the size of a shirt button. The .68s are available in a round knurled shape, as well as an octagonal design, while the .55s are exclusively round knurled. Both sizes can be customized with optional stone inlay, and also with a laser inscription on each of four faces. HollenWolff cufflinks can be inlaid with a variety of stones that provide not only beauty, but also have long been believed to imbue the wearer with certain powers. 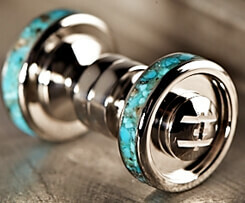 Turquoise provides balance and courage, and is useful for finding wisdom and truth. Tiger’s Eye brings harmony to families and relationships. It encourages one to go with their gut. Malachite is a stunning green stone that attracts wealth. Its energy helps manifest one’s desires and dreams. Red Jasper brings self-mastery to creative ideas. It creates a stabilizing force of good health and balanced emotions. Howlite is a calming white stone that brings forth patience and facilitates communication. Black Tourmaline is a powerful psychic shield, ideal for anyone who must work in challenging circumstances. It has the ability to purify negative energy into usable energy. Lapis Lazuli is a sacred stone from ancient Egypt through the Middle Ages, related to infinite possibilities and bridging the gap to the spiritual world. Also related to the life-giving elements of the planet and it’s innate ability to heal. 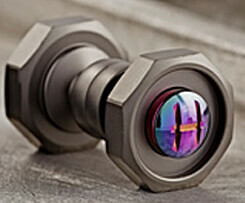 After you choose a size (.68 or .55 caliber) and a shape (round knurled or octagon) it will be time to personalize your cufflinks by selecting a body finish, a button finish, deciding whether you desire stone inlay, and whether you’d like the cufflinks and the aluminum presentation box inscribed with words of your choice.